Have I mentioned lately that I’m a fan of Daniel Pink, bestselling author (A Whole New Mind and Free Agent Nation), public speaker, and all around smart guy? His latest foray into writing is not a book in the usual sense, rather it’s The Adventures of Johnny Bunko, which is created in the popular Japanese manga mode—a comic book for adults sort of thing. 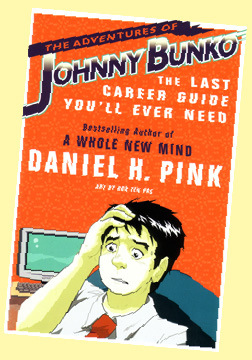 Pink has attached “the last career guide you’ll ever need” to the title and, in fact, he could be right. You can watch the trailer here. I met Dan in December 2007 when he spoke to a large group of company managers. His message, that if we want to attract and retain a new generation of employees we’ll have to think more like they do and less like we do, resonated with me. Turns out, it’s a success! It’s also pretty cool career guide that challenges conventional wisdom, puts Marcus Buckingham’s “strengths movement” in a useful context, and pokes fun at itself along the way. Johnny, it seems, is a pretty typical guy who is trapped in a job that requires him to do what he doesn’t like to do or isn’t good at doing—not unlike many of us. Through a strange set of happenings, he’s introduced to Diana who magically shows up to help him anytime he snaps some chopsticks apart. (Yeah, it’s a bit out there, but stick with it.) From Diana, he learns six “lessons” that will help him redirect his career, life and fortune. The six lessons Johnny learns are not your usual career advice–at least the kind you got from the parents. The first, for example, suggests that it’s not possible to create some sort of “master plan” to get us from here to there–there are just too many variables. This will certainly provoke some lively dinner table discussion. But the broader message in the book is that when we do things that intrinsically motivate us, we’re happier, more successful and make a more meaningful contribution in the world. The movie, The Express, came out this weekend. It’s the story of Ernie Davis, the young African-American football standout whose conviction, character and performance won him the coveted Heisman Trophy, given each year to the most outstanding college athlete. In the case of Davis, he was the first African-American to receive it. 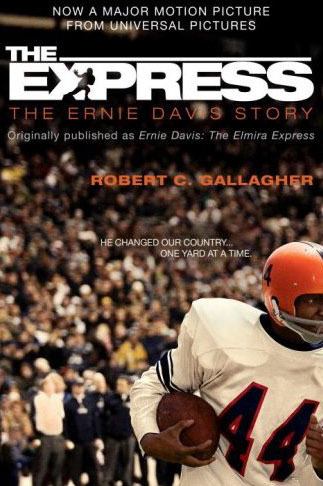 The Express is a vivid and sometimes painful reminder of America in the late 1950s and how a man, determined to be the best football player he could be, helped our country move past its long-held views of people of color. Davis was born in 1939 and was raised in poverty in Pennsylvanian coal mining country by his grandparents. At the age of 12, he was reunited with his mother and new stepfather. They moved to Elmira, New York where he became the star player on his high school team—a fact that did not go unnoticed by more than 50 college teams who offered him scholarships, something unheard of among Black players at the time. He chose Syracuse and went on to help the school achieve national status including winning the Cotton Bowl against the University of Texas in 1959. As a movie, The Express is probably “just okay.” The acting is a bit stilted and some of the casting of the players is inconsistent. But as a story of determination and quietly (and sometimes not so quietly) standing for the fair treatment of everyone, it’s unmatched and inspiring. As I watched the movie, in scenes of anger and hatred so strong that I winced at times, I couldn’t help but think about my biases, subtle and not-so, and wonder how they cloud what I see and how I think about others. The Express stars Dennis Quaid as coach Ben Schwartzwalder and Rob Brown as Davis.